There are few things better than fresh beets from the farmer’s market but far too many people throw away the greens and focus solely on the beets themselves. Not only are you missing out on an incredibly healthy & gorgeous looking part of this great little vegetable, but you’ll also be surprised at how much of a flavour punch they contain. If you’ve just bought fresh beets then you already have the greens on hand so why not give this quick & easy saute a whirl? 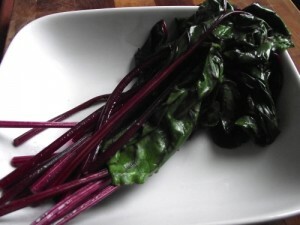 Trim the beet greens to the base of the vegetable and then rinse & dry them. In a large pan add onion, garlic, lemon juice & oil and saute until onions are soft & transparent. Add beet greens turning over with tongs to coat with onion, garlic & lemon mixture and cook until leafy parts are well wilted. Season with salt & pepper & serve hot as a side dish.